Churchill’s view during the 1930s varied inversely with those of Britain’s prime ministers. They looked to Germany as a bulwark against Bolshevism; Churchill saw Germany as the main threat to peace. With his grasp of strategic reality, despite his lifelong antipathy to communism, the Member for Epping became increasingly disposed to an Anglo-Soviet accord in the face of Hitler. The governments in Kaunas, Tallinn and Riga were officially opposed to a Russo-British “understanding,” which many historians believe would have been an open invitation for the USSR to invade.44 But official attitudes were contradicted by important diplomats, notably Ambassador Mikelis Valters, a distinguished statesman with close links to his government. On 23 June 1939, Valters told British minister to Brussels Sir Robert Clive that “a very dangerous situation would arise” if the Allied-Soviet negotiations collapsed. Latvia’s “opposition,” Valters explained, was in fear of Hitler. In truth, a Russo-British agreement to assure its territorial integrity “would be welcomed in Latvia even though there might be, for the sake of form, an official protest.”45 Valters believed “that a declaration of neutrality meant renouncing the principle of collective security of the League of Nations.”46 Valters’ remarks stunned the British Foreign Office, which had been reporting only the official line of the Latvian government; and like state departments everywhere, the F.O. insisted its interpretation was the only correct one. The inevitable action came in June 1940. 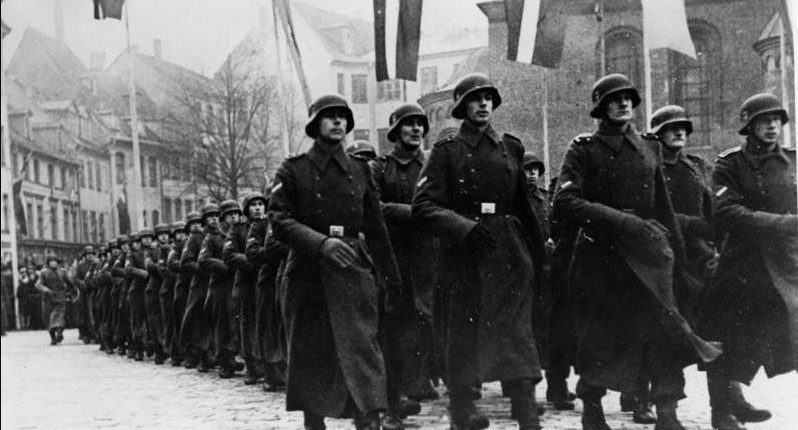 While Hitler was sweeping across France, Stalin manufactured flimsy pretexts to occupy Latvia, Lithuania and Estonia. After “elections” in which only pro-Soviet parties were allowed to participate, the three republics “requested admission” to the USSR, which was graciously granted in August. This statement has been enough for some to conclude that Churchill accepted Soviet control of the Baltic states. But that ignores Churchill’s reaction to the Baltic holocaust in summer 1940, and his mental turmoil—on the one hand desperately needing an ally, on the other hand cognizant of peoples whose liberty he had been among the first to champion. Some critics declare that Churchill was only acting in self-interest. Non-recognition of the Soviet conquest meant Britain would keep £4 million in frozen Baltic assets and twenty-four requisitioned Baltic merchant vessels. Others point to Stafford Cripps, British Ambassador to Moscow, who urged that Churchill send Russia those ships and assets and recognize Soviet occupation in return for “better relations with Stalin.”57These are empty criticisms: The ships and assets were insignificant—Britain often lost that many ships to U-boats in a few days. Eden and the Foreign Office backed Churchill by insisting that relations would not be improved by bowing to Stalin’s demands with nothing in return.58 Churchill would resist recognizing the Sovietized Baltic even when it was to his advantage to do so, in late 1941 and 1942. 29 Edgar Anderson, “British Policy Toward the Baltic States 1940-1941,” in the Journal of Baltic Studies, 1980, XI/4: 326-28. 30 J.P. Trant, Economic Conditions in Latvia (London: HMSO, 1935), 10-12. 32 Ivan Maisky, Memoirs of a Soviet Ambassador (New York: Scribners, 1968). Gabriel Gorodetsky, ed., The Maisky Diaries: Red Ambassador to the Court of St. James’s (New Haven, Conn.: Yale University Press, 2015), passim. 33 Anthony Eden, The Eden Memoirs: Facing the Dictators 1923-1938 (Boston: Houghton Mifflin, 1962), 16. 36 Winston S. Churchill, Step by Step (London: Thornton Butterworth, 1939), 310. 37 Soviet Documents, vol. 3 (London: HMSO, 1962), 329. 38 The Times, London. 2 May 1939. 39 Erick Estorick, Stafford Cripps: A Biography (London: Heinemann, 1949), 171-72. 40 Margaret George, The Warped Vision: British Foreign Policy 1933-39 (Pittsburgh: University of Pittsburgh Press, 1965), 206-07. 41 Winston S. Churchill, “Memorandum on Sea Power,” 27 March 1939, in Martin Gilbert, The Churchill Documents, vol. 13, The Coming of War, 1936-1939 (Hillsdale, Mich.: Hillsdale College Press, 2009), 1414. 42 Churchill, House of Commons, 19 May 1939, in Robert Rhodes James, ed., Winston S. Churchill: His Complete Speeches 1897-1963), 8 vols., New York: Bowker, 1974), VI 6119. 43 Joseph Davies, Mission to Moscow (New York: Simon & Schuster, 1941), 440. 45 David M. Crowe. Jr., “Great Britain and the Baltic States,” in Stanley Vardys and Romuald Misiunas, eds., The Baltic States in Peace and War 1917-1945 (University Park, Pa.: Pennsylvania State University Press, 1978), 177. 46 Edgars Dunsdorfs, Karlis Ulmanis Dzive (Stockholm: Daugavas Apgads 1978), English synopsis, 611. 47 Crowe, “Great Britain and the Baltic States,” 18. 48 Gorodetsky, ed., Maisky Diaries, entries on 6 and 22 October 1939, 232, 317; editor’s note, 326. 49 Visvaldis Mangulis, Latvia in the Wars of the 20th Century (Princeton N.J.: Cognition Books, 1983), 80-94. 50 Robert Rhodes James, ed., Chips: The Diaries of Sir Henry Channon (London: Weidenfeld & Nicolson, 1967), 258. 51 Halifax to War Cabinet, 26 JuIy 1940, in Anderson, 328. 52 Waverly Root, The Secret History of the War, 3 vols. (New York: Scribners, 1946), III, Casablanca to Katyn, 316. 53 Sumner Welles, The Time for Decision (New York: Harper, 1944), conversations of 15 June and 10 July 1941, 182 and 759-61. 54 Roger Parkinson, Peace for Our Time: Munich to Dunkirk: The Inside Story (New York: MacKay 1972), War Cabinet meeting of 16 November 1939, 268. 55 . Winston S. Churchill, Blood Sweat and Tears (New York: Putnams, 1941), speech of 5 September 1940, 356. 56 Maisky Diaries, entry of 16 March 1942, 418. 57 David Kirby, “Morality or Expediency: The Baltic Question in British-Soviet Relations 1941-1942,” in World War II and the Baltic States (State College, Pa.: Pennsylvania State University Press, 1978), 159. 58 Anthony Eden, The Eden Memoirs: The Reckoning (Boston: Houghton Mifflin, 1965), 79. Richard Langworth visited the Baltic in 1992 and again in 1995, when he bicycled the Latvian coast from Lithuania to Estonia, and presented a Latvian translation of Churchill’s The Dream to then-President Guntis Ulmanis. This is an updated version of articles in Finest Hour (1986-87) and in National Review (1990), with new entries based on The Churchill Documents, Vol. 13 (Hillsdale College Press, 2009) and the Maisky Diaries (2015).